This polish was an Essie for J. Crew exclusive, and it’s not on the J. Crew site anymore. I just started idly looking around during the interest in the neon pink toenails fiasco, and noticed this gorgeous, light creamy brown in old cached search results. Although it’s sold out online, it’s still sitting around at some J. Crew stores, which is where I grabbed mine. I understand that there have been a few other Essie for J. Crew exclusives, and I’m not sure why I didn’t pay attention at the time. Maybe because I try to stay away from the J. Crew website and catalog because I don’t need $150 sweaters, and I didn’t see much about the polishes from the Essie side. But this is a really pretty polish, I’m so happy to have found a bottle. It’s a light, slightly pinkish leaning brown. It also has a bit of yellow in it and can look a tiny bit camel-y in some lights. It went on nicely and took three coats to be fully opaque. Lately I’ve been prone to fall in love with whatever polish I happen to try, and this one was no different. It might be because I am in a better mood in general now that it’s spring. But when I wore this I kept catching sight of my fingers and thinking about how perfect and pretty this color is-it seems impossibly glamorous and low key at the same time. It’s a cleaner and more lively brownish beige than most-it has a light, milky feel and looks warm and pretty, with no grey or black grimy-ness. And, the bottom label is really cute! Look at that! It says J. 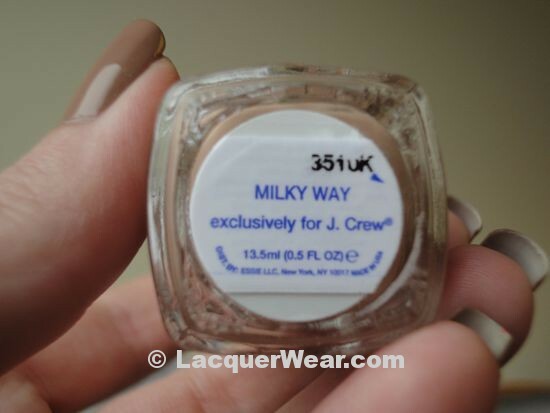 Crew on it, so there’s no mistaking that this shade is different from other Essies. So satisfying.